Profile: Sacha is a Conservationist and Creative Consultant to the Wildfowl & Wetlands Trust (WWT) based in Slimbridge. Her childhood spanned the big waves and reefs off Sydney, the remote Australian bush, a large manor in Suffolk and villages in France and Switzerland. A tomboy with endless hours to herself in wild places, she developed a passion for wildlife and hatching outrageous plans. She also learnt that she could hold her breath long enough to scare people! This led her to beat the world record for breath hold (6 minutes 22 seconds).. Recently, Sacha has become known for the award winning ‘Flight of the Swans’ expedition where she followed the migration of the endangered wild Bewick swans 7,000 km through 11 countries from Arctic Russia to the UK. 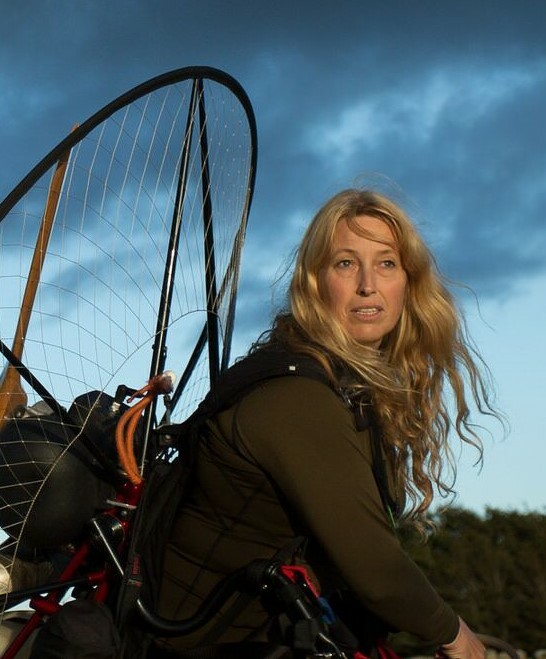 To enable her to do this, she overcame a fear of flight to fly a paramotor (hanging from a piece of cloth by strings with a big fan on her back). En route her mission was to speak to people – from nomads to farmers and politicians - and find out why so many swans were being lost. The project generated huge amounts of media attention, debate, and a wide range of practical wins for conservation. She is the first woman in over 50 years to be awarded the Britannia Trophy for this feat of aviation. Hi, thought this Lecture may be of interest http://www.wildernesslectures.com/speaker.php?id=234 ----------------------------- Recently, Sacha has become known for the award winning ‘Flight of the Swans’ expedition where she followed the migration of the endangered wild Bewick swans 7,000 km through 11 countries from Arctic Russia to the UK. To enable her to do this, she overcame a fear of flight to fly a paramotor (hanging from a piece of cloth by strings with a big fan on her back). En route her mission was to speak to people – from nomads to farmers and politicians - and find out why so many swans were being lost. The project generated huge amounts of media attention, debate, and a wide range of practical wins for conservation. She is the first woman in over 50 years to be awarded the Britannia Trophy for this feat of aviation.